Tom Leahy is CEO of BDM Boylan Solicitors and its Business Advisory arm providing strategic advice and practical support to Munster based SMEs and private clients to help them achieve their ambitions. He has over 37 years of experience in the Financial Services Industry both in Ireland and the UK working with AIB and RBS Group/Ulster Bank. For the past 15 years he has worked for Ulster Bank and was their Regional Director South for SME Banking where he gained significant experience in supporting the financial needs of SME's/Credit Unions/Farming Sector. He has significant experience of Business Transformation, Process Re-engineering, Start-Ups, High Growth Companies, Project Management and Risk Management. For the past 7 years he was Chair of the Bank's SME People Board and was heavily involved in Talent Development and Coaching. He is a Chartered Banker and Fellow of the Institute of Banking. He has a Diploma in Insolvency and Restructuring from Chartered Accountants Ireland as well as being a qualified Personal Insolvency Practitioner. His experiences include Retail, SME and Investment Banking. 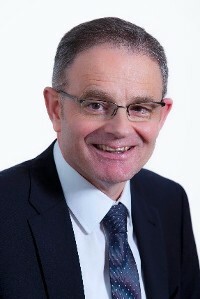 He has been heavily involved in Restructuring work in terms of Business Operating Model and Stressed SME Lending where he chaired the Strategy and Action Planning Forum during his time working with RBS/Ulster Bank. He has performed senior roles in Change management, Lending, Compliance and Risk.